TasteBud B told me he’d never been to Square Cafe before, so I decided to share the experience with him. We were fortunate to be seated right away because it is a weekend morning hotspot, especially when the weather cooperates and there is outside seating. I had a very delicious crepe with brie inside, drizzled with honey and covered with fresh fruit. Very light flavors, but a filling meal. The food was excellent and the service was great. Square Cafe put some thought into this dish too – instead of the typical heavy fruit syrup, the honey was sweet and light. The fruit was very fresh. Compared to a few weekends ago when TasteBud B chose the better meal at Bistro To Go, today I seemed more pleased with my meal. TasteBud B went with a very hearty breakfast with some very creative flavors – at least on the menu. What hit the plate was a slightly different story. 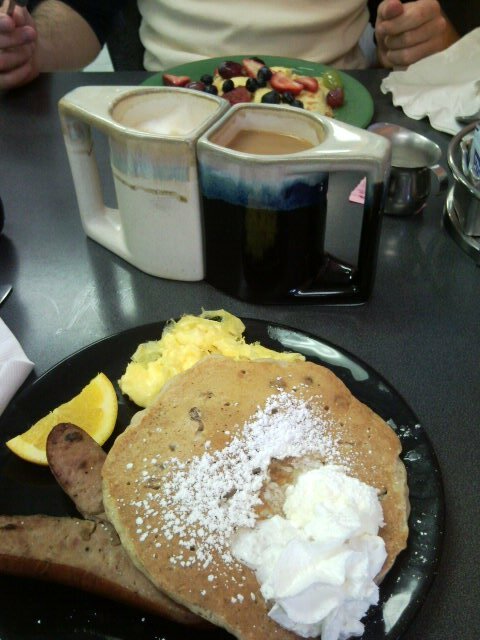 The Square Breakfast with chicken apple sausage, oatmeal raisin pancakes, and scrambled eggs. The eggs were cooked perfect – and needed no additional seasoning or condiment. Unfortunately the sausage was dry and the pancake, as you can see was covered in both powdered sugar and a whipped topping. The whipped topping melted into a milky mess on top of the hot pancake and he just ended up pushing it off to the side. It was as if the pancake wasn’t cooked completely. Much like a par-cooked cookie, the middle was a little doughy, which only added to the heaviness of the pancake. On a bright note, his Cafe Americano was well brewed and only $1.80! Oh, and how can I forget my Caramel Latte which was phenomenal. The atmosphere was young and bright. Great for a morning breakfast spot on a spring day. Previous Pizza in the Strip!